Whenever California history experts start talking to me, my eyes glaze over. California has a lot of history, and a lot of historians, who have found out a lot of stuff. So, when I want to talk about California history, especially in old Los Angeles, I just talk about Zorro! 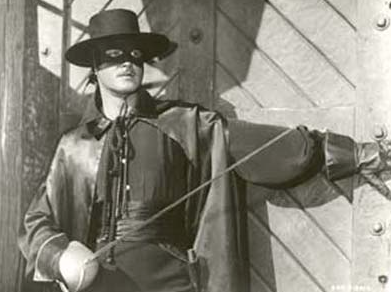 Yes, the fictional character of Zorro was set in Los Angeles. If you've seen movies, or cartoons, or comic books of him, he looks like he's doing his swashbuckling in Spain, or Mexico. Well, he kind'a is, because that's what Los Angeles was in 1820. The original book, which was renamed the Mask of Zorro (from the Curse of Capistrano) was written in 1919, and set in old California, in a town that was originally called El Pueblo de Nuestra Señora la Reina de los Ángeles (the Town of Our Lady Queen of the Angels). Nowadays people just say LA, or Los Angeles, in Zorro's time they called it El Pueblo. When I lived in Los Angeles, I would talk about historical things around town, and most people would just roll their eyes, wondering what was wrong with me. I visited Hollywoodland, I went to the La Brea Tar Pits. There's a lot of history in Los Angeles! And while Zorro is just fictional, his town wasn't.